Rare vintage Rolex Corvette. Not the car but the warship. 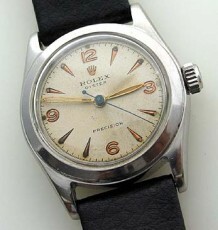 This was a Wartime Rolex with 24 hour military dial. 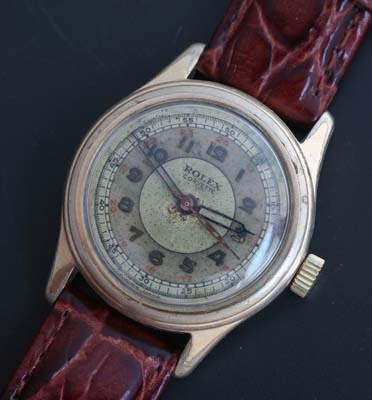 This is a rare 1940’s vintage Rolex in untouched and original condition. The Rolex Corvette was named after the famed type of warship used during World War 2. The watch has a patinaed original 2 tone dial with 24 hour chapter showing military time. The dial is all original and untouched. The hands are the original set although the luminous has fallen out over time. I have left them as it sits to preserve the originality of this watch. The case is the original nickel plated brass model with some minor wear through the original plating. Again, the case has not been restored or re-plated, just cleaned. 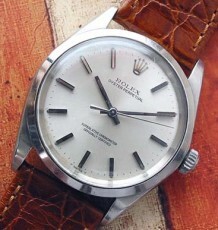 The Rolex manual wind 10 1/2 hunter movement is unusual in that it is timed to 6 positions as a Chronometer would be. 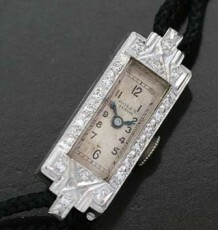 Also the movement is listed as an 18 jewel model rather than the typical 17 jewel model. 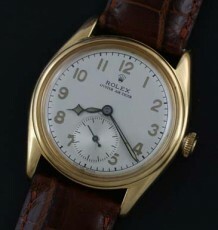 This is bonafide war time collectible and is one of the rarer models from Rolex produced during this period. The case measures 30 mm wide by 36 mm long and is supplied on the buyers choice of black or brown straps.